It may sound odd to speak of lions in the role of bridge supports, yet such a structure actually exists in St. Petersburg. 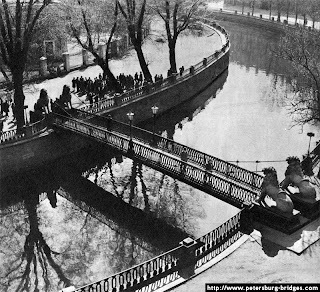 We are speaking of the Lions’ Bridge that spans the Griboyedov Canal where it loops picturesquely in the vicinity of Theatre Square. Four cast-iron lions squat on their hfeunches on its abutments, forelegs braced, heads thrown back, jaws gripping the slender iron chains that sustain the weight of the span. The powerful, handsome beasts are more than merely ornamental, for they contain within themselves systems of metal rods, or bars, to which the chains are anchored. 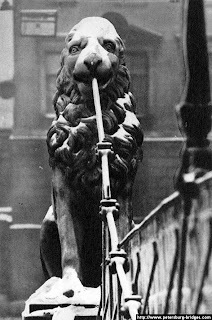 The Lions’ Bridge is an interesting example of the integration of engineering and sculpture. Much like the lions are the fantastic golden-winged griffins holding the chains of the Bank Bridge which spans the Griboyedov Canal near the Cathedral of Our Lady of Kazan. In excellent harmony with the slender silhouette of the bridge is the fretwork of its railings, reconstructed in 1952 in strict accordance with the original drawings. 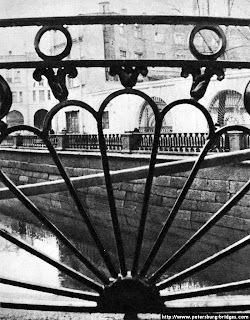 The Lions’ Bridge and the Bank Bridge were built in 1825-26 to the design of G. Traitteur, who had at an earlier time designed the suspension footbridge over the Moika, not far from the Main Post Office, after which it is named. Its chains were supported by obelisks braced by quadrant-shaped metal rails, and embedded in the abutments. 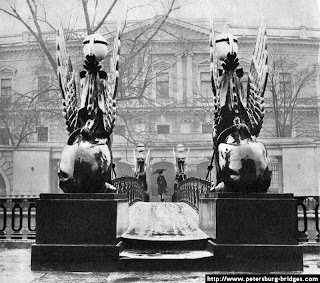 The sculptured figures of the Lions’ and Bank bridges were cast from the models by P. Sokolov, author of the well-known Girl with a Pitcher fountain in the park at Pushkin. 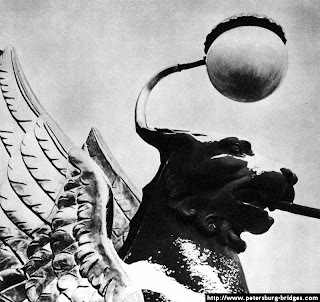 The four sphinxes of the Egyptian Bridge, which carries Lermontovsky Prospekt over the Fontanka, are also the work of P. Sokolov. The Egyptian suspension bridge was built in 1826 by G. Traitteur and V. Christianovich. Today, the only original elements of this bridge are the four sphinxes. On January 20, 1905, a stfing of loaded wagons and a guards cavalry squadron happened to be crossing the bridge at the same time. Strong vibration set in, and the bridge collapsed. There were no casualties among the men, fortunately, everyone managing to scramble ashore. The Egyptian Bridge was rebuilt in 1955-56. Its steel frame structure is in the shape of a gently sloping arch. Designed by V. Demchenko, P. Areshev and V. Vasilkovsky, it fits perfectly into the panorama of the Fontanka. 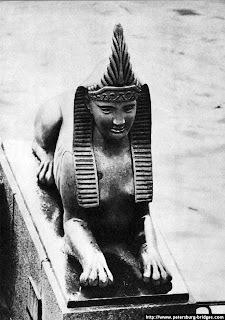 The cast-iron sphinxes, now over 150 years old, form an integral part of its composition. Among the numerous sculpture-decorated bridges of European cities, one of the most famous is the Anichkov Bridge in St. Petersburg. 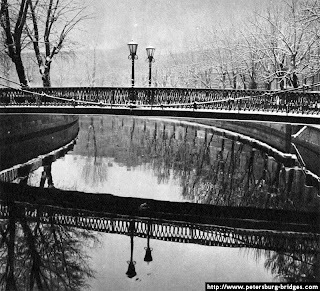 An on-line compilation of a photographic study of the bridges in Leningrad (the former name of Saint Petersburg), published by Aurora Art Publishers, Leningrad, 1975. The disastrous flood of 1824, vividly described in Alexander Pushkin's The Bronze Horseman, carried away or damaged a great many of the city's timber bridges. This necessitated the construction of several new cast-iron and masonry spans in the late 1820s and the 1830s. St. Petersburg was founded on May 16 (27), 1703, when the corner-stone of the future Peter and Paul Fortress was laid on Hares' (Zayachy) Island. 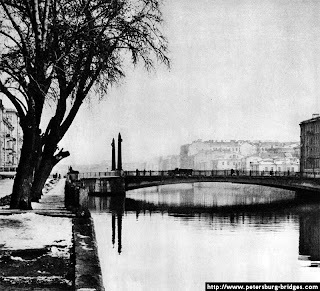 Simultaneously the construction of timber dwellings started on the right bank of the Neva, on Gorodovoy Island which now forms part of the so-called Petrograd Side. 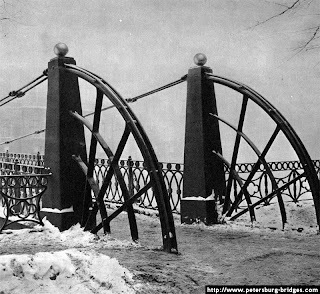 With the introduction of iron as a building material, in the beginning of the nineteenth century, bridge construction in St. Petersburg entered a new phase. 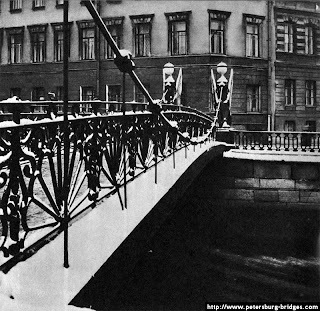 The first cast-iron city-type bridge appeared in 1806, at the intersection of Nevsky Prospekt and the Moika. 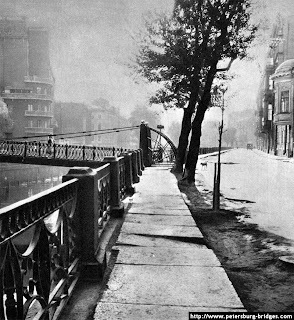 In those days it was called the Green or Police Bridge.